If you come from the countryside to live in the city, as I did, you always carry a thought in your mind of what is happening at each season of the year out there in the landscape beyond all this. Then sometimes you are surprised by the unexpected reminders of the rural, even in a place as urban as Spitalfields – as I was this week when these red berries caught my eye. 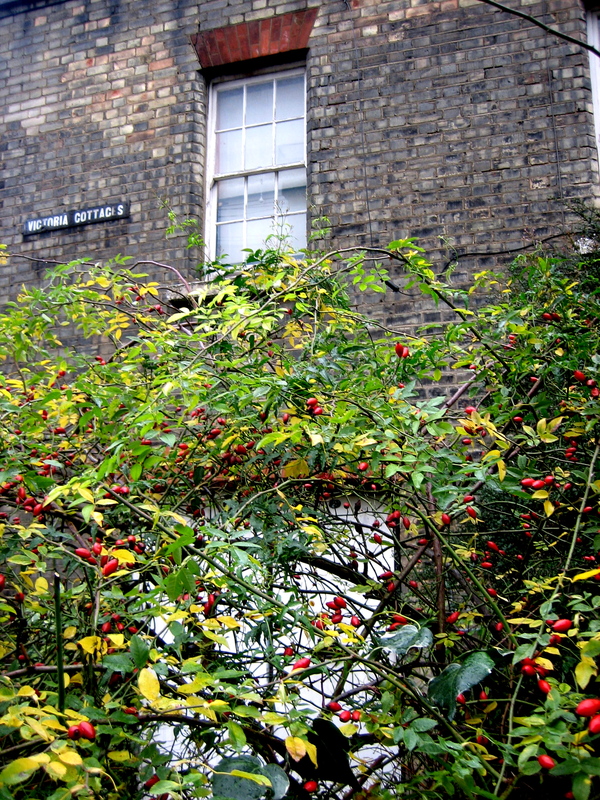 There is this beautiful stand of Mountain Ash or Rowan in Hanbury St that are heavy with berries at present. I do not know who had the notion to plant these trees here twenty or thirty years ago but it was an inspired choice. I will not go into all the folkloric associations of this native species, except to say that the Scottish crofters grew them outside their homes to keep bad luck away. Their lyrical presence evokes the wilderness where I have seen them growing to cover whole hillsides. 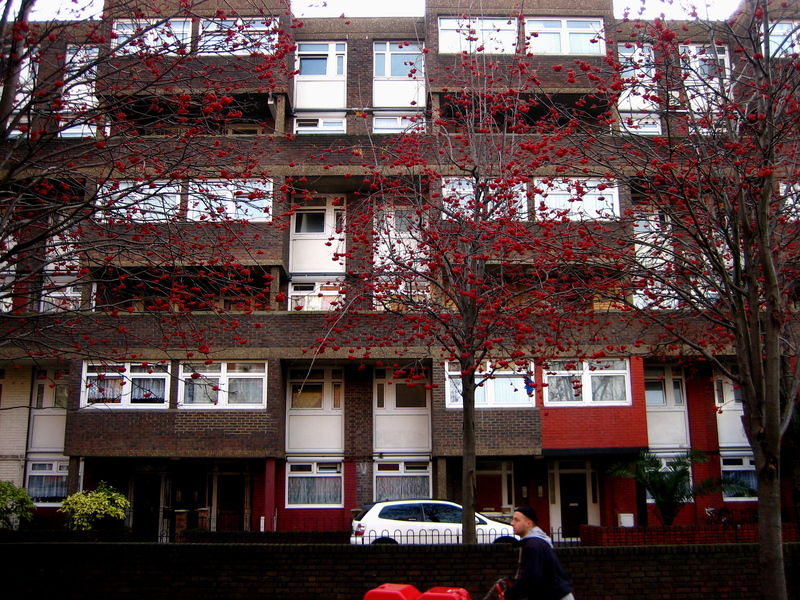 These sinewy Mountain Ash trees create an anachronistic yet sympathetic contrast with the powerfully geometric housing on the south side of the street, and their scarlet berries counterbalance the dark brickwork of this modernist scheme against the bright terracotta-coloured bricks of the nineteenth century Deal St School (where Mark Gertler was educated) on the north side. At this time of year, there is a certain moment in mid-afternoon when the light begins to fade and the individual twigs upon the trees can no longer be distinguished, then they merge into a grey mistiness like a tangible darkness gathering between the branches. With the Mountain Ash covered in berries, this effect is amplified because they seem to acquire a reddish glow in the dusk. Then once the street lights come on, the berries shine brightly like rubies, glistening with translucence in the orange halogens and, to my mind, there is no man-made festive decoration that can compete with these Mountain Ash berries – which seem even more exotically beautiful in such a harsh urban environment. Walking round the corner to Victoria Cottages, I photographed these fine red hips on a wild rose in a pleasantly overgrown garden of an attractively un-renovated cottage, just through the iron gate of this quiet nineteenth century terrace up an alley off Deal St. My grandmother used to say that all these berries were a sign of a harsh winter to come, nature’s provision for the birds. Though I choose not to ascribe to this belief, I have noticed an increase of activity among the birds and squirrels in Spitalfields this last week as the temperature has dropped – searching for food – and I am reminded that once these berries are gone it will be time to begin putting out bird seed again. Great shot of the Mountain Ash trees – those shades of Red! Lovely post. You should take a look at the fig trees in the little alley to the old Shoreditch tube station, off Brick Lane. Lovely post! Love the rowan berries and Mark Gertler. But don’t want to think about how cold London will be when I get there! Nice efforts the past week, gentle author, have been checking in but rushing off again.